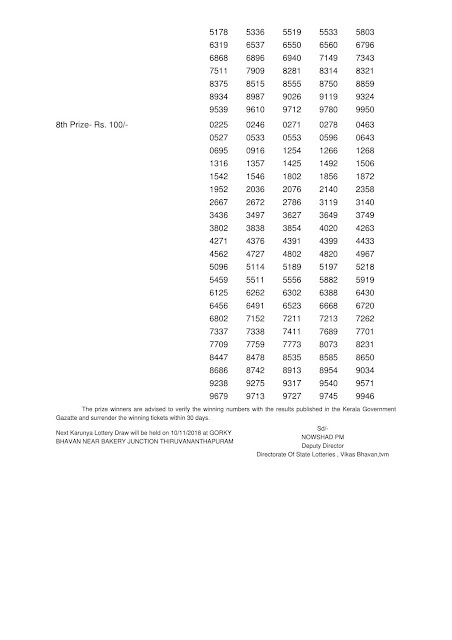 Kerala lottery result of Karunya KR-369 on 03 Nov 2018 lottery is published below. Kerala lottery result live of KR-369 Karunya from 3:00 PM and full result at 4:00 PM. Karunya weekly lottery is published on every Saturday. 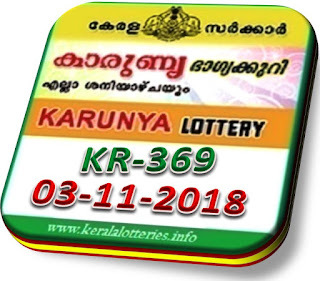 Today Karunya KR-369 lottery draw starts from 3 PM and live result numbers are expected to be released by 3:03 PM. Official Kerala lottery result will be published by 3:45 PM here. Karunya KR-369 lottery carries a first prize of Rs. 80 lakh, one second prize of Rs.10 lakh and twelve third prizes of Rs. 1 lakh. Fourth to eighth prizes are from Rs.5000/- to Rs.100/-. An amount of Rs. 14,82,66,000/- is waiting to be disbursed today through 1,86,865 prizes. Kerala lottery Karunya KR-369 result published today on 03.11.2018 in www.keralalotteries.info. 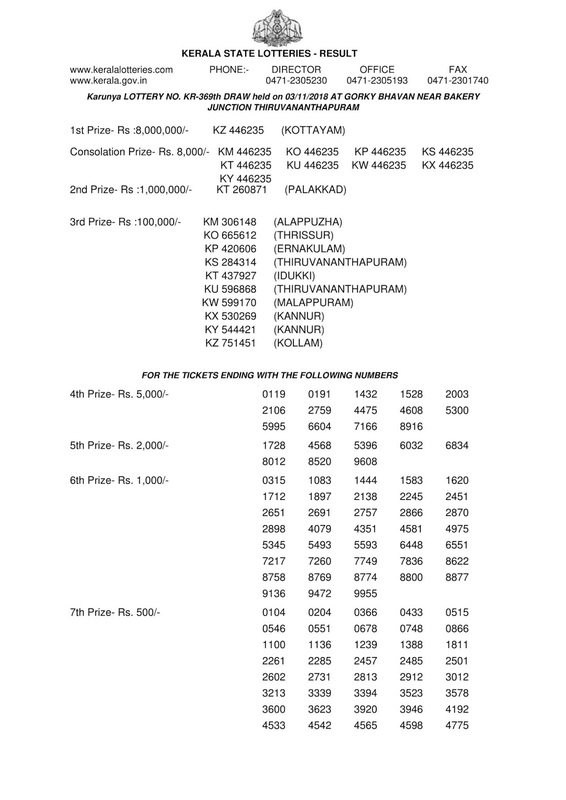 Check you winning numbers from the Kerala lottery results published here. .Tomorrow on 10-11-2018 Kerala lottery "KARUNYA (KR-370)"draw at 3:00 PM and the live Kerala lottery result tomorrow will be published from 3:03 PM and Official Kerala lottery result by 3:45 PM. Pournami (RN-364) lottery draw will be held on tomorrow (04-11-2018) Sunday at 3: PM and the result will be published by 4:00 PM.